Low light and cold weather can be a recipe for disaster at times. Make sure you’re seen and safe while also staying warm and comfortable enough to get the job done when you wear your Occunomix Men’s LUX SWTHZBK High Viz Black Bottom Full-Zip Sweatshirt. Occunom ... (see full details) (see specifications) #LUX-SWTHZBK. Low light and cold weather can be a recipe for disaster at times. Make sure you’re seen and safe while also staying warm and comfortable enough to get the job done when you wear your Occunomix Men’s LUX SWTHZBK High Viz Black Bottom Full-Zip Sweatshirt. Occunomix is a leader in the high visibility industry, creating high quality workwear at a fair working price. This high viz safety gear is ANSI-approved and warm enough to keep you going in the cold weather. With reflective taping and all of the warmth and softness of fleece, you can work in the comfort of your favorite men's sweatshirt while staying safe and visible in low light conditions. This 100% polyester fleece sweatshirt is perfect for any hard-working guy or gal. The 9-ounce weight of the Occunomix high visibility sweatshirt is an ideal “working weight”- not too hot when you’re moving and sweating (yes, we sweat even in cold weather), while trapping enough body heat to beat the chill. The high viz yellow top half of this men’s full-zip sweatshirt is accented with 2-inch silver reflective tape at the waist, shoulders, arms, and wrists for the most visibility possible. The black bottom half and cuffs are a sharp contrast to the top. This high viz sweatshirt is ANSI 107-2010 approved for your safety. With a built-in adjustable hood, you have protection from the chill or moisture when the weather takes a turn. The adjustable draw cords have stoppers to hold the hood tight when you need it. The full front zipper is a durable option for easy on and off, too. The cuffs and waist hem of this men's outerwear are elastic and fitted to help seal in your body heat and keep moisture and debris out. Two lower front reach-in pockets are perfect for warming your hands or storing small items in a convenient location. 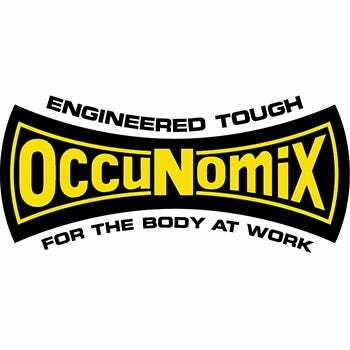 When it comes to blending tough men's workwear and safety gear, Occunomix is a name we trust for high quality gear at a price we can approve of. With ANSI approval and 2-inch reflective taping on high viz yellow fabric, you'll be seen and be safe in this Occunomix Men’s LUX SWTHZBK High Viz Black Bottom Yellow Full-Zip Sweatshirt from Working Person's Store. The warmth and comfort of the polyester fleece is similar to your favorite leisure hooded sweatshirt at home, offering all of the comfort you need on the job as well. Warm without weighing you down, you'll love your new high viz work sweatshirt from Occunomix. I am a Plumber (Commercial New Construction), ordered six (6) of the Occunomix sweatshirts for myself and my crew. Received them quickly and was pleasantly pleased at the quality and "beefy" nature of construction. Even though it is currently July and temps over 100 degrees I know that soon we will all be warm, comfortable and SAFE in our new sweatshirts. This has been my first order through WORKINGPERSON.COM it will not be my last. American Craftsmanship with Pride and Excellence! I needed a new sweatshirt for work and thought this class III would be the ticket I wore this for the first time last night at my son’s race. I was extremely disappointed to find out that it felt like having Jets of air in my sleeves. The air seem to be coming in where the reflective tape is. By the time the sun went down I was cold. The reflective tape is not sewn on so I don’t understand how this was happening. This would be a nice sweatshirt if you were working inside, with no wind and temperature above 60 degrees. My $10 sweatshirt from Walmart keeps me warmer. I am a plumber that works commercial construction. Wore this for the first time last night at my son’s BMX race. It was like wearing a sweatshirt that has jets of air in the sleeves. The wind blew right through this sweatshirt where the reflective tape is. The reflective tape isn’t sewn on so I don’t understand how this was happening. By the time the sun went down I was COLD! I have never experienced this before with class 3 safety gear or my $10 sweatshirt from Walmart. This would be nice while inside, with no wind and above 60 degrees. Occunomix Sweatshirts: Men's LUX SWTHZBK High Viz Black Bottom Full-Zip Sweatshirt is being added to your cart.